1. 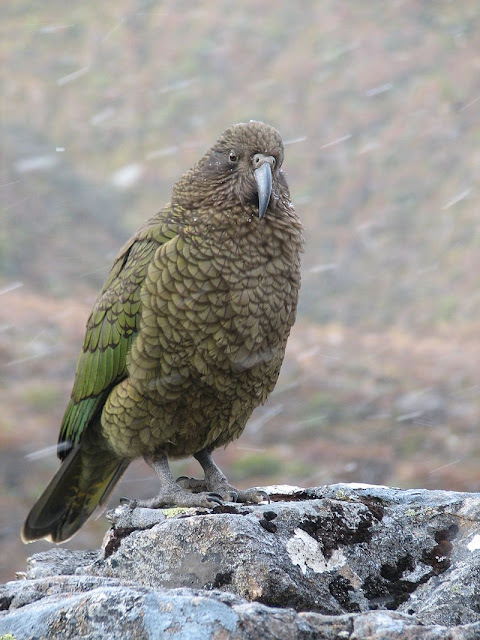 The Kea is one of relatively few parrots to be found at high altitudes, where it has adapted to the limited resources of the alpine zone by evolving a highly omnivorous diet and an unusual degree of curiosity and manipulative intelligence that sometimes sets it at odds with the human inhabitants of these regions. 2. It is a hawk like green parrot which used to live on fruits like all other parrots. 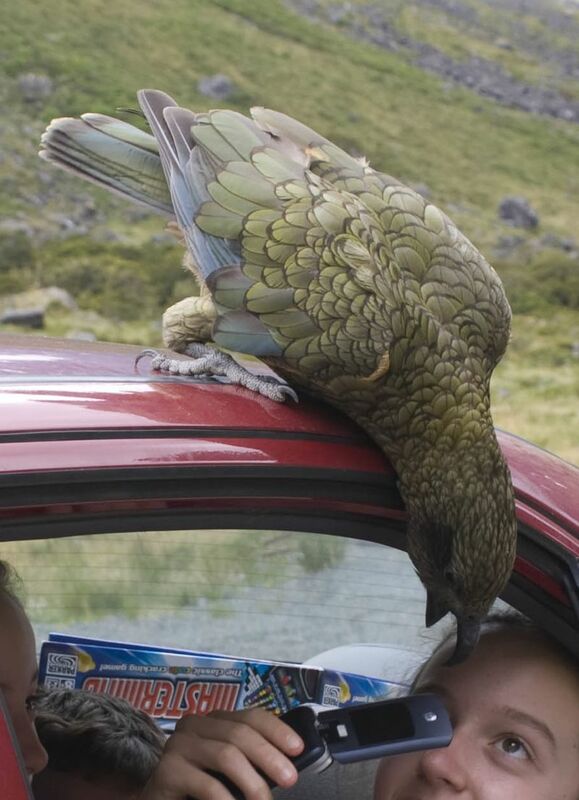 When the people, who went to settle in New Zealand, brought sheep to the Island, the Kea gave up its fruit-eating habits and started feeding on sheep. It kills sheep by attacking them with its powerful beak and feeds on the fat that surrounds the kidneys. It has become a serious danger to sheep farms. 3. Its cry resembles that of a cat. 4. Maori named the parrot as 'kay-a' due to it's flight. 5. The Kea is one of the most intelligent bird in the world. 6. The Kea is also known as the 'clown of the mountains'. 7. The Kea is the only alpine parrot known to man, they have a wingspan averaging one metre and are considered by many to be very intelligent. 8. The Kea lives in the South Island of New Zealand and is commonly found in beech forests and on mountain slopes. It is considered an omnivore due to its consumption of grass, tree roots, insects and dead animals. 9. The sharp talons and beak of the kea are used in combination to make feeding easier. The talons are used to grip prey and bring it up to the beak which is then used to rip the flesh from small animals such as rabbits. This adaptation is vital to the Keas survival as it allows for easier capture of prey and easy consumption of food gaining allowing for nutritional gain. 10. It also has green and brown feathers which allow it to easily blend into the beech forest environment where it is so commonly found, therefore disallowing its predators to see it. 11. The Kea has digestive capabilities of an omnivore allowing it to take and use nutrients gained from both meat and plants. This is a useful adaptation as in the cold and high pressure conditions that it lives in food can be hard to come bye therefore is does not have to be picky about what it eats. survival in the harsh habitat it lives in. 13. Being curious allows it to explore large areas to find food and leave no rock unturned, therefore finding food a more often than les curious organisms. 14. 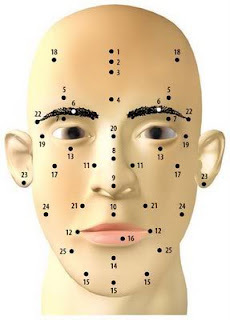 Their intelligence has given them the ability to return to places they have previously found food, at similar times in an attempt to find food their again. The kea build nests underground to protect their young from the harsh cold and some predators. 15. They also appear playful in there curious behaviors and have been observed sliding down roofs, pulling apart car windscreen wipers and even sliding down ski slopes. However all of these playful behaviors equip them for survival as they gain a resilience to the mountain environment. 16. Wild creatures do not usually change their food habits easily. The Kea Parrot, a native of New Zealand is an interesting exception.